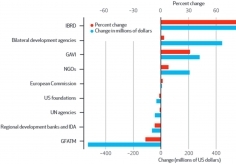 Public financing of health by domestic governments nearly doubled between 1995 and 2006, according to IHME research. 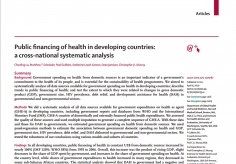 The study, Public financing of health in developing countries: a cross-national systematic analysis, also analyzes the effect of development assistance for health, gross domestic product, government size, debt relief, and HIV prevalence on government health spending from domestic sources. The study was conducted in collaboration with Harvard Medical School. Health spending has been taking up a growing share of overall government spending. Large parts of Latin America, the Middle East, and Asia have increased government commitment to health. Countries with large HIV epidemics are among the largest recipients of health aid, but they did not appear to increase government spending on health as a result of the aid. The researchers analyzed spending data from developing countries and health aid data from agencies, multilateral institutions such as the World Health Organization (WHO) and the International Monetary Fund (IMF), and hundreds of nonprofit groups. They then employed advanced statistical techniques to test whether factors such as health aid, debt relief, national income, overall government spending, and HIV prevalence affect domestic health spending. Using two distinct statistical models, the team analyzed government health expenditure data from WHO and IMF. Spending reports are often missing entire years’ worth of information, particularly among the poorest countries, and data from IMF and WHO can be difficult to reconcile. They also tested different groups of countries and found that the results did not differ substantially across these groups. By researching the relationship between development assistance for health and domestic health spending, IHME intends to help guide policies that will have the greatest possible impact on improving health. 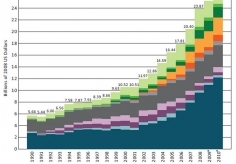 IHME has dedicated a segment of its research every year to track where funding allocated for health is being spent.